This image taken by the Mars Exploration Rover Opportunity's panoramic camera shows the rock nicknamed "Last Chance," which lies within the outcrop near the rover's landing site at Meridiani Planum, Mars. The image provides evidence for a geologic feature known as ripple cross-stratification. 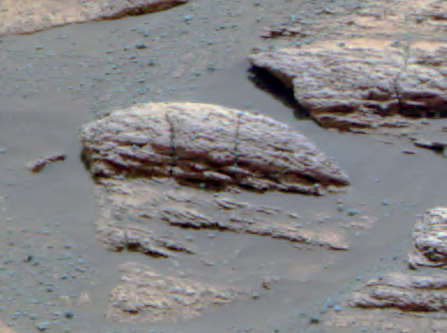 At the base of the rock, layers can be seen dipping downward to the right. The bedding that contains these dipping layers is only one to two centimeters (.4 to .8 inches) thick. In the upper right corner of the rock, layers also dip to the right, but exhibit a weak "concave-up" geometry. These two features -- the thin, cross-stratified bedding combined with the possible concave geometry -- suggest small ripples with sinuous crest lines. Although wind can produce ripples, they rarely have sinuous crest lines and never form steep, dipping layers at this small scale. The most probable explanation for these ripples is that they were formed in the presence of moving water. Lets take this a bit farther down the speculation road. For those who have posted in this forum and have stated Mars was always a desolate planet are we to believe this warm moist planet just sat there lifeless? "If the was liquid water for a long period of time"
I just created a warm moist medium out of sterile materials in a sealed jar. How long should I wait before life is created? >I just created a warm moist medium out of sterile materials in a sealed jar. How long should I wait before life is created? You need a bigger jar. The point is maybe no length of time is enough. Maybe life dosn't just happen when there is warmth and water and time.No mater if it will or wont we will never be able to witness the start. We just dont have the time! We can study our whole life long and not solve that question. It just seemed like richard was stacking the speculated deck. It's easy for Mars to be and remain lifeless even if all the perfect conditions necessary to establish life were present, if the conditions weren't there for a long enough time. Nobody knows yet if they were sufficient and if they were for a long enough time. Amino acids form natually in even an abiotic environment like in outer space dust. If there was water and volcanic activity on Mars, there would have always been liquid water, even in an iceage. Hot springs would be perfect as there is plenty of energy in that system. Amino acids can bond in water and certain amino acids can replicate themselves if there is plenty of amino acids around. All the above is not speculation. Given enough time, functioning long chain amino acids could arise. Why stop there since this would be the dominant replicating thing. If so much as a single spore or bacteria invaded your jar...not long. Where are the panspermias? I just created a warm moist medium out of sterile materials in a sealed jar. How long should I wait before life is created?" Well based on fossil evidence on Earth, I'd say somewhere in the vicinity of 200 million years or so (I believe the oldest evidence of microbial life is around 3.8 billion years). As for making media and expecting spontaneous generation--you haven't specified what exactly you'd put into this media. Considering that we can't grow about 95% of all extant bacteria and archea in media, its obvious we aren't clever enough to figure out how to get life from scratch. But, again, from the fossil evidence, its obvious that getting life is nota really difficult thing given water and energy. ...given water and energy and time. I thought the question here was: how could Mars possibly be sterile if there was water? One answer is: it could be sterile if there wasn't water long enough. Is there anywhere on the face of the earth that is a truly sterile natural environment? I don't know of any. Given the sheer pervasiveness of life on earth, I tend to conclude that 'life' is inevitable, as long as water, an energy source, and some sort of surface or medium to host chemical reactions are present. 'Life' is certain as long as the correct conditions exist. 'Life' is certain as long as the correct conditions exist. Time is not that important a factor. Actually, yes, there are parts of the dry valleys in Antartica which are effectively sterile. There might be fungal and bacterial spores and/or other bacteria in an inactive state, but the counts are really, really low and nothing will ever grow there (under current conditions). The other place is in the Atacama desert. Its exceedingly dry and exposed to high UV flux. You'd be hard pressed to find significant amounts of microbial life. But that is about as close to sterility as you find on the surface. As for the assertion that someplace could be sterile given transient water--well, I'd argue that its looking like the water on Mars was more than transient. If we are accepting that life is generated de novo (as opposed to panspermia), it looks like 200 million years is the upper bound for how long it takes to develop almost all of the extant metabolic diversity we see today. Its quite possible it happens in a million years. So the question really is how long were there substantial bodies of water on Mars and when did they finally disappear? If the disappearance is long after the emergence of spore forming bacteria on Earth, its quite possible there was some transfer between planets. But we don't need to appeal to interplanetary transfer given that the emergence of life seemingly happened readily on Earth. It wouldn't have taken long on Mars either. Of course this is all moot given the evidence of extant water on Mars today (the seeps, the water in the poles and subsurface, etc.). It doesn't really take a lot of water for microbial life. Yes, life needed round about 200.000 million years on earth to emerge if we jugde from the oldest fossils. (But could have been faster as well). Let's assume that Mars had sufficent liquid water for that period of time. (Which we don't know even after yesterdays announcement). Let's assume that the water slowly went away after that time. Then we could think of having bacteria (or maybe even some kind of social bacteria colonies which might have formed sperules ) evolved that were then faced with a "water crisis". Now for that situation we have no example on Earth because it just didn't happen on Earth. Maybe it was forced to develop mechansims to contain water inside life itself as much as possible, maybe it hid under a nearly water impermeable crust or developed such a crust itself. of evolution of a whole planet under "water shortage conditions" on Earth. I appreciate the argument for the probability of life on Mars. However, a concern of mine is the amount of time it would take a large body of salty water to percipatate out that sulfur outcrop. I bet it's safe to say that we're looking at tens of thousands of years of development just for the exposed part (adding more years as deep as the outcrop goes). Also, I came across some images from the MGS showing evidence of active water processes within large crater walls on Mars (in todays time). Has anyone seen thoses images? If so, can you post a link. I found them to be very exciting. Most sedimentary rock here on earth has visibile fossils of advanced life forms. If either of the rovers get to scan other crater walls of sedimentary strata, we will have a good chance of finding Martian fossils if life had time to evolve into advanced forms. Evidence of single celled or soft-bodied life would be much harder to find, though. I am going to enjoy waiting for more results! Does anybody know how to solve the geologic time frames we are looking at within the rocks on Mars? Do the Rovers have the tools to discern a time frame? I would like to see Hud's question answered about how long the water existed. Now that they have prooven that water existed for some time on Mars, I would like the rovers to go to deeper craters for a longer period of geologic evidence. Hopefully along the way, they will find something to give them a geologic time frame (but i doubt it, too many variables). Also, with deeper craters, there will be more layers and opportunities for our creative eyes to see stuff. As I recall, many of the low lying areas of Mars have "shore lines" on the bordering high ground. Is it possible to deduce the age and durration of shoreline? Again, there seem to be too many unkown variables at this point. once again I assume that as long as there is singnificant atmosphereic pressure, the volume of water on the surface would be stable indefinately. I do not recall reading any clear evidence of what happened to deplete the Martian atmosphere. Possible loss of magnetic feild? It was a funny moment at the press conference the third time a reporter asked Steve Squyres how long the water had been there and/or how long ago, and he said something like, "Look, when I said I don't know it's because I DON'T KNOW." He claimed a varety of Martian rocks, from well documented locations -- i.e. what lays above what -- in an Earth lab are really the only way to determine the times. I guess the tools are too big, expensive, and complicated to take the ride to Mars. Anyway, the rcurrent overs don't have the means. Some elements have forms (called isotopes) with unstable atomic nuclei that have a tendency to change, or decay. For example, U-235 is an unstable isotope of uranium that has 92 protons and 153 neutrons in the nucl eus of each atom. Through a series of changes within the nucleus, it emits several particles, ending up with 82 protons and 125 neutrons. This is a stable condition, and there are no more changes in the atomic nucleus. A nucleus with that number of protons is called lead (chemical symbol Pb). The protons (82) and neutrons (125) total 207. This particular form (isotope) of lead is called Pb-207. U-235 is the parent isotope of Pb-207, which is the daughter isotope. Many rocks contain small amounts of unstable isotopes and the daughter isotopes into which they decay. Where the amounts of parent and daughter isotopes can be accurately measured, the ratio can be used to determine how old the rock is, as shown in the following activities. At any moment there is a small chance that each of the nuclei of U-235 will suddenly decay. That chance of decay is very small, but it is always present and it never changes. In other words, the nuclei do not "wear out" or get "tired". If the nucleus has not yet decayed, there is always that same, slight chance that it will change in the near future. Atomic nuclei are held together by an attraction between the large nuclear particles (protons and neutrons) that is known as the "strong nuclear force", which must exceed the electrostatic repulsion between the protons within the nucleus. In general, with the exception of the single proton that constitutes the nucleus of the most abundant isotope of hydrogen, the number of neutrons must at least equal the number of protons in an atomic nucleus, because electrostatic repulsion prohibits denser packing of protons. But if there are too many neutrons, the nucleus is potentially unstable and decay may be triggered. This happens at any time when addition of the fleeting "weak nuclear force" to the ever-present electrostatic repulsion exceeds the binding energy required to hold the nucleus together. Very careful measurements in laboratories, made on VERY LARGE numbers of U-235 atoms, have shown that each of the atoms has a 50:50 chance of decaying during about 704,000,000 years. In other words, during 704 million years, half the U-235 atoms that existed at the beginning of that time will decay to Pb-207. This is known as the half life of U- 235. Many elements have some isotopes that are unstable, essentially because they have too many neutrons to be balanced by the number of protons in the nucleus. Each of these unstable isotopes has its own characteristic half life. Some half lives are several billion years long, and others are as short as a ten-thousandth of a second. This is the reason that it would be nice to have a truck load of rocks from many locations.